The Humble Nindie Bundle has been an intriguing development for the Wii U and 3DS eShop; though limited to the Americas, it has caused a notable impact as the first Humble Bundle to support console platforms. It was a pretty bold move by both Nintendo of America and Humble itself, and allows gamers to pay what they want for up to 11 eShop games (more with cross buy). The two week promotion has almost drawn to an end, however, so this is a reminder for those on the fence to consider their options quickly. 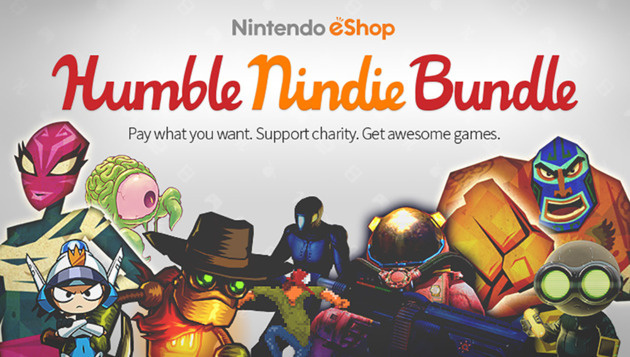 The nature of the promotion means you can pay $1 or pay a great deal more, it's up to you to decide how much to pay to the developers, Humble Bundle itself and the assigned charity Code.org. The details on the game options are below. Are you a Nintendo gamer in the Americas that's taken the plunge already, or are you still tempted? Let us know in the comments. I hope, when the dust settles, all involved are happy with the success of this and that it's just the beginning. Pick it up while you can people, I hope we get the same opportunity in the not too distant future! jumped on this one when runner 2 was announced. AMAZING value. I'll probably remember to check out all the others someday. I wish I could but I already own Guacamelee, Woah Dave, and Mighty Switch Force. I have most of the games offered anyway cause I'm always buying indie titles on Nintendo consoles cause I love the selection and supporting indie devs. Great deal. Many of the included games have been on my wishlist but I haven't justified the prices with little amount of gaming time I actually have. But for the price I couldn't pass it up. @Sawdy I love Runner 2, playing it at the minute actually, hadn't played any of the bit.trip games before, so good! @MrWalkieTalkie So, uh, that prevents you from buying it, supporting the other devs and getting over $50 in value? You do know you can give any spare codes to a friend or something, yeah? BTW note: olliolli and steam world dig you get for both console!! I haven't tried any on my Wii U yet but I have played Mighty Swith Force, OlliOlli, Gunman Clive, and Moon Chronicles. It took a while to find the right control scheme for that game, and they still ok at best, but cool game. Gunman Clive is great, OlliOlli is good but the controls are also tough, and I am really enjoying Mighty Switch Force. Already had Guacamelee so I gave that code to my brother-in-law in the hope that he'll get his Wii U online and buy my nephew Splatoon. Haven't redeemed any of the other codes yet as we'll dole them out over the summer after the boys are done w/ school. Anybody know how long I have to redeem the codes? Guess I should go press a few buttons to generate them huh? Got it the first day, it has been a great deal! Trying to play them one at a time, so that I don't overwhelm myself. Say, does anyone know if Humble Bundle codes expire? I redeemed and downloaded all the 3DS games, but I won't be able to enter the Wii U codes in until tomorrow. Should I "redeem" them now and enter the codes tomorrow, or what? @OdnetninAges A few days ago i gave some humble bundle codes i had, over a year easily, they still work. Im pretty sure they dont expire to be fair, and if they do i guess you can ask for them again. @Faruko The codes for e.g the Mewtwo DLC had an expiration date. I guess it is up to Nintendo. @NintenBo wait so you can get the bundle even if you've already owned the three pay anything games for a while? Anyone can get the bundle... if you already own some of the games, just give the codes for those games to someone else. If you have an interest in any two of the available games, it's a great deal at $10... I have thoroughly enjoyed Guacamelee and Steamworld... haven't even gotten to the others yet! $10 gets you everything on the list, and while you can decide which portion of your money goes to charity, which is always a good thing, I made sure 100% of my funds went to the developers. They have to eat too, right? Even if you own some of the games, you receive download codes so you can always give them away. The codes do not expire as far as I know (take note @rjejr); furthermore, you get 2 codes for OlliOlli- 1 for each system, but it only takes 1 of them since the game has crossbuy. Once you redeem one of the codes simply go to your other system and find the game on the eShop and it should say $0.00. This leaves you with an entirely separate code that can also be used to redeem the game on both a Wii U and 3DS. Just bought the bundle. I'll give away some codes to strangers on min verse or something. Will a EU bundle be next? I'm a stranger to you, aren't I? Of the six 3DS games that came in the bundle (assuming one got the premium tier), "Woah Dave" has been the game I've been playing the most lately. @Vriess Certainly stranger. I can only give away Bit.trip and Mighty Switch Force. I wasn't going to get this because I own a few, but caved a couple days ago, and I'm glad I did. OlliOlli is awesome! Also I have codes to give away for SteamWorld Dig on 3DS, Mighty Switch Force, and Gunman Clive. One per person, reply to this with which one you want and your email and I'll send it to you. @MetaSmasher I'll take the SteamWorld Dig one. Thanks! I got all the games for $10, amazing deal! Guacamelee is worth that alone! @MetaSmasher [email protected] can I have the leftover code you may still have?